Sour gas and sour water are terms used to describe gas and water containing significant amounts of hydrogen sulfide. Sour water and sour gas applications abound at oil refineries and natural gas plants. The “sweetening” of gas and water refers to the processes used to remove hydrogen sulfide and organosulfide compounds. Hydrodesulfurization is a method of sulfur removal employed at refineries and natural gas plants. It is a catalytic chemical process used to capture the sulfides in natural gas and refined petroleum products, including gasoline, jet fuel, kerosene, fuel oils and diesel fuel. The hydrogen sulfide gas is subsequently converted into elemental sulfur with the Claus Process. The tailing gas from this process is wet scrubbed to remove any remaining hydrogen sulfide or sulfur dioxide gases. One reason that it is important to remove sulfides from natural gas and refined petroleum products is to reduce the sulfur dioxide emitted when the fuel is combusted in automobile engines, power plants and furnaces. The U.S. Environmental Protection Agency (EPA) has focused on SO2 as a pollutant for decades. The largest sources of SO2 emissions are from fossil fuel combustion at power plants (73%) and other industrial facilities (20%). In 2010, the U.S. EPA revised the primary SO2 National Ambient Air Quality Standards (NAAQS) by establishing a new one-hour standard at a level of 75 ppb. The EPA revoked the two existing primary standards because they would not provide additional public health protection given a one-hour standard at 75 ppb. According to the U.S. EPA, current scientific evidence links short-term exposures to SO2, ranging from 5 minutes to 24 hours, with an array of adverse respiratory effects, including bronchial constriction and increased asthma symptoms. These effects are particularly important for asthmatics at elevated ventilation rates (e.g. while exercising or playing). Studies also show a connection between short-term exposure and increased visits to emergency departments and hospital admissions for respiratory illnesses, particularly in at-risk populations such as children, the elderly and asthmatics. Wet scrubbing is one of the processes used to remove sulfur dioxide. 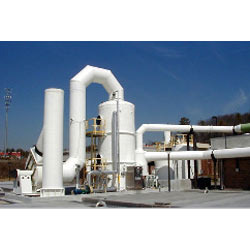 During this process, particulates and pollutants are removed from a gas stream through contact with a scrubbing liquid. The scrubbing liquid is typically water that is recirculated through a sprayer at the top of a tower, with the gas stream moving up the tower from the bottom. This counter current flow is used to efficiently capture the particulate matter and absorb specific chemicals from the gas. Acidic solutions absorb alkaline gases such as ammonia and alkaline solutions absorb acidic gases such as sulfur dioxide (SO2) and carbon dioxide (CO2). Many sulfur removal and recovery methods require pH measurement. In wet scrubbing, it is important to maintain the scrubbing solution’s caustic level in order to effectively remove sulfur dioxide. If the solution’s pH gets too low, the acidic sulfur dioxide gas is not absorbed, leading to corrosion and the possible release of sulfur dioxide into the environment. During hydrodesulfurization, the water used must be maintained at the proper pH. When pH electrodes are used in sulfur removal and recovery processes, several issues occur that can affect the accuracy of the pH reading. The primary issue is that sulfides contaminate the silver/silver chloride (Ag/AgCl) wire in the reference half-cell of the pH electrode. When the Ag/AgCl wire is contaminated, pH readings are offset and replacement of the pH electrode is required. Coating of the pH glass with oils or hard-water scale and physical breakage are also common problems. 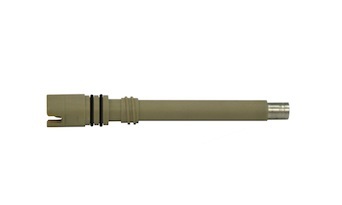 The Model 2005130 Sulfide Resistant pH Electrode from Electro-Chemical Devices (ECD) features a unique design that dramatically slows the sulfide contamination rate to extend the life of the sensor. Its low-porosity membrane materials and unique reference gels are specially treated to withstand destructive sulfide attacks. The sulfide-resistant pH electrode’s innovative reference junction design, state-of-the-art gel technology and proprietary reference fill solutions have facilitated unprecedented sensor life in these rough applications. The unique reference electrolyte substantially slows the rate of sulfide contamination in the reference half-cell, increasing the time before the Ag/AgCl wire is attacked. This sulfide-resistant pH electrode’s design was evaluated in a Claus Process tailings gas scrubber. In the past, the best expected pH sensor performance was six to eight weeks in a sulfur broth. The electrode’s designers responded to customers’ requests for longer pH sensor life by improving the sulfide resistant electrolyte, utilizing special reference gels and further isolating the Ag/AgCl wire and silver content so as to provide chemical and physical barriers to the marauding sulfide ion. Implementing these design changes extended the average life of the electrodes to over three months. Ideal for the harshest oil and gas production environments, the electrode features reference junctions that are manufactured from porous Teflon, providing an inert surface that resists fouling and is easily cleaned. The electrodes can be manufactured from a variety of materials—such as PEEK or RADEL—to contend with and ultimately resist aggressive chemical corrosion. They are available in either insertion-style or retractable-style packages. Its rugged pH glass bulb offers a faster response, and the new internal stem configuration makes the glass electrode (measurement half-cell) more resistant to breakage. A full guard (crown) protects the bulb from solids. The internal preamplifier provides a noise-free signal when using this higher-impedance, thicker glass bulb, and the rugged stainless steel sensor housing provides sensor strength and assists in shielding the signal. The pH electrode is compatible with the ECD Sentinel reference diagnostic, which allows monitoring of the pH electrode’s reference half-cell. This provides knowledge about the reference electrode’s integrity, the primary failure point, allowing the degradation or contamination to be addressed before it becomes catastrophic. The pH electrode operates over a 0 to 14 pH range with a capability to handle temperatures from –5°C to +130°C. In addition, the electrode can survive in pressure up to 300 psi at 25°C. Accurate pH measurement is an essential part of most sulfur removal and recovery methods utilized at natural gas plants and oil refineries. 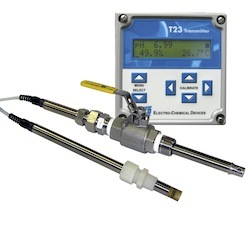 The sulfide ion, however, is corrosive and destructive to pH electrodes, easily contaminating the sensor and leading to measurement inaccuracy. A sulfide-resistant pH electrode has been developed specifically for long life in high sulfide concentrations, with the electrode’s expected operational life well exceeding three months.